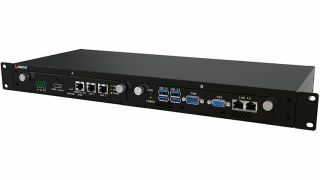 The What: Arista Corporation, a leading manufacturer of video wall LCD displays, AV extenders, matrix switchers, AV MultiViewers, and related products for the AV installation and industrial markets, is pleased to announce the RS-121 1RU Rackmount Computer with Integrated HDBaseT KVM Extender. Designed for applications where a computer’s screen output needs to be extended to a remote display, the RS-121 makes an excellent choice for control rooms, live event production, AV signage, and similar uses. The Why: The RS-121 houses two swappable modules: the MicroBox-1100A-E01 computer module and the ARD-1006-A07-TX HDBaseT KVM transmitter module. These two modules are inter-connected internally, which eliminates the need for a technician to inter-connect the two modules. As both modules are swappable, they can easily be replaced within a few seconds in the event of a component failure or to upgrade the system. The HDMI output, RS-232, and USB ports of the computer module are connected to the Extender transmitter internally. As a result, the receiver at the remote location will be able to access the RS-232 and USB ports of the computer, as well as the display. The What Else: Arista’s RS-121-E01 features an Intel Atom E3845 1.9GHz quad-core CPU and up to 8GB DDR3 memory. The system is capable to run either Microsoft Windows or the Open Source Linux operating system. Accessible ports on the front of the RS-121 include a four port USB 3.0 hub, dual Gigabit Ethernet, one RS-232/422/485 BIOS selectable COM port, a CFast slot, and a VGA port. The MicroBox-1100A-E01 provides the necessary computing power for a wide range of applications, including Pro-AV controller and Client for Cloud Computing applications. The HDBaseT transmitter module on the RS-121 provides an HDMI Loopback output that allows the user to view the same content that is displayed at the receiver’s display, a 2-port 10/100 Mbps Ethernet pass through hub, plus a Power over HDBaseT output. With a single CAT6 cable, the unit transmits video signals, RS-232, USB and 10/100 Ethernet, as well as PoE. Equally notable, the RS-121 provides the ultimate integrator-friendly installation experience. The Availability: The Arista RS-121 1RU Rackmount Computer with Integrated HDBaseT KVM Extender is expected to be available by the end of March 2018. MSRP: $845.